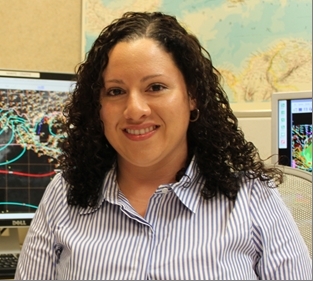 Q & A with NHC - Nelsie Ramos, Ph.D.
How did you get interested in weather? It has been a part of me since I was a child. But I did not think of meteorology as a career until I was in college, when a professor encouraged me to do graduate work in it. What did he see in you that made him suggest that? I'm not sure. I was doing my Bachelor's degree in math and computer science at the University of Puerto Rico at Mayagüez, and I was part of a NASA applied science program in GIS and remote sensing. That was a good base to start a meteorology program. But it meant the hardest part, the meteorology, was still ahead. Even so, it was not your first choice. When I was in high school, I was thinking of a career in aeronautical engineering and becoming a NASA astronaut. This is not the typical choice of a teenage girl. I think my father had to be some part of that; he was in the military. I would also look up at the sky and stars with my mother and I was fascinated with all of it. But I did not consider the meteorology until that one professor came to me with his suggestion. That was even with my having experienced Hurricane Hugo in 1989 and Hurricane Georges in 1998. So you went for it. I did! After I got my Bachelor's degree, I was selected to work as an IT Specialist at the Geography division of the Census Bureau in Suitland, Maryland. While in the DC Metro area, I met my Ph.D. advisor from Howard University. He knew my interest in the meteorology field and admitted me in the Atmospheric Science Program, awarding to me a NOAA Center for Atmospheric Science Fellowship. I was a little burned out from getting the Bachelor's degree and was not even thinking about Graduate School. So I decided to quit the IT position and go for a Master's first. And once I was there, I said I only wanted to do hurricane research. Howard University did not have that specialty, so I was given the liberty of working with NOAA's Hurricane Research Division (HRD) in Virginia Key, Florida. I liked my experience there so much that I decided to continue for a Ph.D. I recall first seeing you here at NHC in 2009. Yes, I was in my second year of the Ph.D. program and got here as part of the NOAA Educational Partnership Program Graduate Science Program. Part of the program's focus is to gain hands-on experience to eventually gain a position. It is a win-win program for both the agency and the student. So I got some training in NHC's Tropical Analysis and Forecast Branch (TAFB) as well as worked doing collaboration research with the NOAA National Centers for Environmental Prediction (NCEP) Environmental Modeling Center (EMC). Between the Ph.D. and the different jobs, there was a lot going on during that three-year period. But it was worth it. Now you are back at TAFB. I am on the analysis desk. At the beginning, it was a big challenge. I had been working for a long time in applied and scientific research, so working in operations was a bit of a shock. I had to figure out if I belonged here and how I would fit in. And there is the shift work. I am about to begin my first set of midnight shifts. For the time being, I want to continue learning the operations in TAFB. One of my interests is the Dvorak satellite technique, so I want to learn that. The position also lets me interact directly with the hurricane specialists and help them as a Hurricane Support Meteorologist during landfalling tropical cyclone events or in a needed basis. Any desire to become a hurricane specialist? Who knows? I never close off an opportunity. What advice would you give to a young girl with any interest in science? I would tell her that she'd have to be very organized, determined, and go for what she wants to do in life. When you find yourself doing what you love, you will be happy. Follow your instinct and work hard for what you want. What do you do outside of the academic and analysis world? I have an artistic music vein. I used to sing in choirs and many times accompanied symphonic orchestras. So I enjoy performing arts events and karaoke. I love the outdoors, including skating, running, even skydiving!